* 8 x Flower Power four foot bulbs, our best seller. * 1 power plus 7 chain cords to connect them all to a single outlet. The F64 ballast is a low profile, US built, solid steel fixture that has ports to chain the fixtures together. Each has a male and female port, so you plug in any of the fixtures, then just use the chain cords. 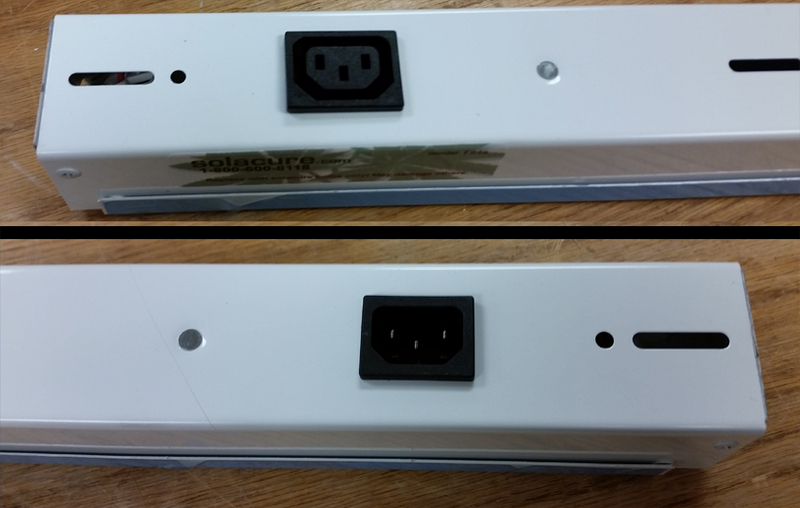 These use the same C13/C14 ports that you find on the back of a computer, so you can buy extensions or addition cords anywhere. (ie: we don't lock you into buying just from us). These come with 120v plugs, but you can run them on 208 or 240 by simply replacing the plug, as all our electronics are universal voltage and automatically adjust. No other modification is required. How many fixtures you need depends on the layout. Small grow areas generally need 2 FP bulbs per 1000w hood. Larger grow areas can get buy with an average closer to 1.5 per 1000w (or equip.) of hood. Maybe as little as one per 1000w in a perfect setup, although it is usually hard to get the right coverage with that few unless you run 5 or 6 foot off the canopy, so the light spreads out more. This means a single 8 pack will cover the same amount of area that 4 to 6 hoods (or 8 to 16 of the 315w CMH fixtures). Each fixture is dual wattage. They ship as a standard F32 powered fixture, around 20-24w to the bulb. 98% of you will leave it just as it comes. If you do run 6 foot off the canopy, like in large room grows or greenhouses, you can open the case of the fixture, uncap the spare blue wire, and plug it into the lamp holder that has the one blue wire. Now the fixture runs twice as hot as before, around 40+ watts. You should NOT do this if you are running close to the plants, as you will burn them. Each fixture has holes to mount chains, but no mounting hardware is included, as everyone does it differently. When you get the fixture, just pop off the cover and extend the lamp holders into their slots. We ship them inside the fixture to protect them from damage. Then just hang them around 24" over the canopy, plug in and chain them together. If you have 4 or more 1000w hoods, this is the best deal and wildly popular. First, you will save a lot of money because you don't have to wire an outlet over each hood. Second, this is more flexible anyway, as you can move the fixtures without having to worry about outlets. Finally, when you buy the bulbs and fixtures in packages of 8, we are selling them to you at the same price as our less expensive fixture, plus throwing in the $10ea cords at no extra cost to you. If you need 8 or more fixtures, this makes the most sense. If you need a different mix of cords, for instance, all 120v cords, or 2 120v cords and 6 chain cords, no problem. Just call to place your order. The price will be the same. We can create a custom mix and usually ship out within one business day. Note: This is a heavy item, almost 50 lbs, and shipping will run $65-$80 depending on how far you are from NC. This includes insurance. If you order more than one 8 pack, the 2nd+ will ship for free, saving you an extra 10%.